So Saul took 3000 best soldiers with him to find David so that he can kill him. On the way, Saul saw some sheep pens around the entrance to a cave. Saul felt very tired so he went into the cave to rest. David and his men were at the back of the same cave where Saul is resting. David’s men said to him, “Today God had delivered Saul into your hand.” David sneaked over and cut off a small piece of cloth from Saul’s robe then hid back in the cave. When Saul woke up, he didn’t notice anything missing and left the cave. David and his men also got up and left the cave. David caught up with Saul and said, “Your Majesty, why are you trying to harm me? Why did you listen to those men who told you that I plan to harm you? Did you notice a piece of your robe missing? If could cut off a piece of your cloth from your robe, I could have kill you but I didn’t. There is a proverb that says, ‘Only evil people do evil things.’ I am not going to kill you. But I pray that the Lord will judge between you and me and punish you. 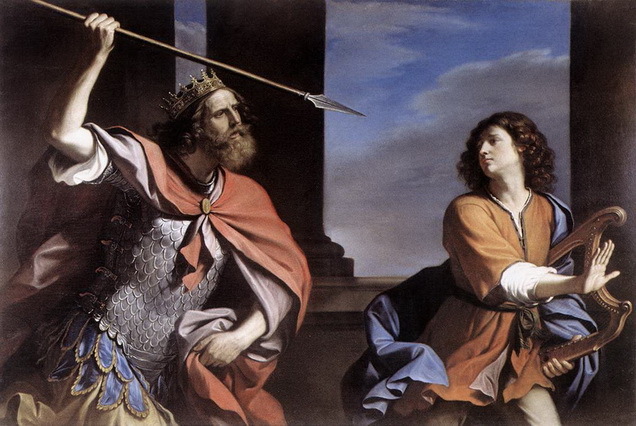 David promised Saul that he will not wipe out Saul’s descendants when he becomes king. Saul went home and David returned to his hiding place.